I escaped the office for 30 minutes today and found a wee haven of peace and tranquility in the Scottish Parliament’s sculptured gardens. Wild flowers have been planted along each raised bank. 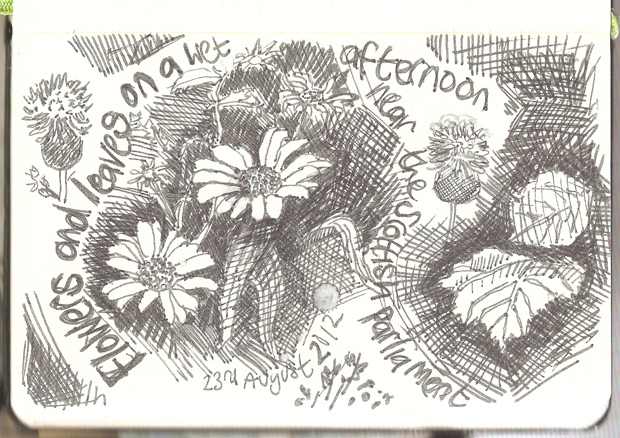 I could sketch from the variety of flowers, thistles and spiky leaved plants for hours. Especially in the sunshine which we had today, albeit with a scattering of showers which had me taking cover under the trees by Dynamic Earth. If you fancy a break from the crowds of the Royal Mile and the fringe then just head down hill, to the Parliament.